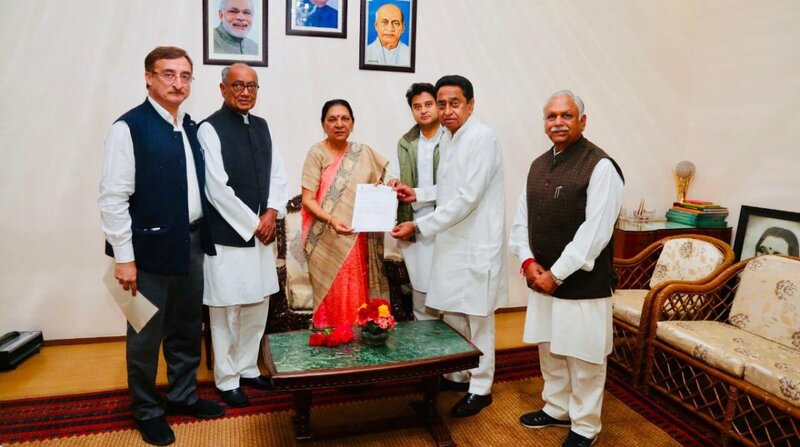 Congress leaders in Madhya Pradesh met Governor Anandiben Patel at Raj Bhavan on Wednesday to stake claim to form the government after emerging as the single-largest party in the state. Madhya Pradesh Congress Committee chief Kamal Nath along with senior Congress leaders Jyotiraditya Scindia and Digvijay Singh submitted the claim citing figures showing absolute majority. Madhya Pradesh Congress spokesperson Narendra Saluja told reporters that the party has a total support of 121 MLAs. “We have met Governor and staked claim to form government. We have the support of 121 MLAs, the situation is clear,” he told reporters. The Congress, which won 114 seats in the 230-seat assembly, was just two short of the majority mark of 116. Following the results, the Bahujan Samaj Party (BSP) and the Samajwadi Party (SP) extended their support to the Congress in the state. The BSP bagged 2 seats and the SP took 1. Independent candidates took home 4 seats in the elections that went down the wire with the BJP and the Congress going neck-and-neck till the penultimate moments of counting. Congress workers across the state began celebrations as the path to a government formation became clear. Supporters were seen taking out bike rallies with the Congress flag in Bhopal. The party is however yet to finalise a name for the CM’s post. The Congress fought the elections without naming a chief ministerial candidate. The names of Kamal Nath, Scindia and Singh, who is a former Chief Minister, are doing the rounds. Congress leader Shobha Oza told ANI that a meeting of party MLAs will be held at 4 pm today. Senior Congress leader AK Antony will be present as an observer. “After it we will put in a word with Rahul-ji,” Oza said. Earlier today, Chief Minister Shivraj Singh Chouhan resigned from the post declaring that the BJP was not going to stake claim.